The Huskers celebrate after a 30 to 3 victory over the Buffs. Callahan quickly burned Harrison Beck's redshirt and the Huskers end up winning the game. Was it worth it? The Huskers lose to the Jayhawks for the first time since 1968. The Blackshirts record another sacks bringing this year's total to 39. QB Brad Smith led the Tigers in rushing with a staggering 246 yards on the ground scoring 3 touchdowns. The Blackshirts added 4 more sacks bringing this year's total to 34. RB Cory Ross (#4) scored all 3 of the Huskers' touchdowns, 1 rushing and 2 receiving. LB Adam Ickes (#49) blocks a 46 yard field goal attempt to save a 7 to 6 victory over the Panthers. Daniel Bullocks scored 1 of 3 defensive touchdowns for the Blackshirts with a 30 yard fumble return. Bo Ruud recorded 5 tackles and half of a sack, but more impressive was the 27 yard interception for a touchdown to put the game away. Zac Taylor laid claim to the starting QB job with a record breaking performance in the Spring Game. 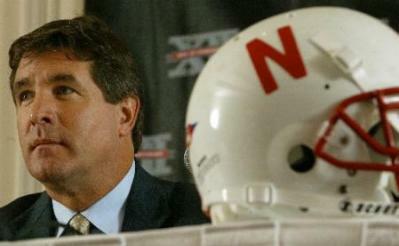 Callahan refuses to settle for nothing less than the best players to fill the Huskers' 2005 recruiting class.